Press-Release of the All-Slavic Union - In Moscow, from March 27th to March 29th 2019, the „International Geopolitical Congress on Global Security - and Scientific Technological Progress." has been held within the building of the Academy of Sciences of the Russian Federation in their „Presidential Hall“. These congress was initiated by the Russian Academy of Rocket and Artillery Sciences, the Russian Academy of Sciences, the Russian World Service International Public Movement, the World Advanced Research Project - the WARP-Group (Community of Scientists of the World Advanced Research Program) with the support of Universidad Autónoma Metropolitana - UAM (Autonomous University of Mexico City). 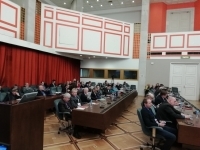 The concept of the Congress was approved by the Russian Academy of Sciences, the Ministry of Defense and the Ministry of Foreign Affairs of the Russian Federation. The congress was further more organized with the support and participation of the “International Union of Public Associations - All-Slavic Union", "Union of Officers of the Russian Army" and other organizations.